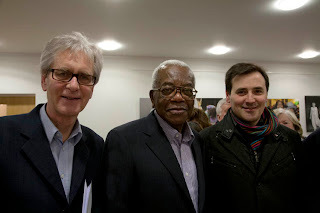 Alessandro Gallenzi with Sir Trevor McDonald and Prof Ian Bruce (new Chairman of the Richmond Society) at yesterday's talk by Sir Trevor at a packed Duke Street Church in Richmond, the first in a series of talks organized by the Richmond Society. It was a delightful occasion, and the talk was interesting and insightful. It was also good to catch up with some other illustrious residents, such as Clive Bradley and our Alma author Robert Chesshyre. Alessandro trying to persuade an unconvinced Donna Léon that the publishing world is not doomed. Anthony McCarten listens attentively behind his shoulders while sipping excellent champagne offered by Diogenes during their lavish 60th-Anniversary party at the Frankfurt Book Fair. Photo courtesy of Diogenes.